The Katabatic Flex 22 Quilt is expertly designed, built with high quality materials, and works great for spring, summer, and fall backpacking trips. We love the versatility, warmth, comfort, and weight savings of the Flex 22, and we've been impressed with its performance on the trail. Katabatic quilts are made in the USA by a small manufacturer based in Colorado and we think their stitching, materials, and attention to detail is excellent. Sizes: Three length choices fit hikers up to 5'6", 6', or 6'6". The 6' and 6'6" models also come in regular or wide. Temps: Comes in 40°F, 30°F, 22°F (reviewed here), and 15°F models. WEIGHT - One of the key benefits of backpacking quilts is they have excellent warmth-to-weight ratios, which is true in the Katabatic Flex 22 as well. Depending on the size you choose, the Flex 22 will weigh between 21-28 oz, which is very light for a sleeping bag or quilt. This is a big win in our books, and a very important consideration for any backpacking trip. WARMTH - Katabatic rates this quilt to 22°F, but like many small manufacturers, this quilt is not EN tested (read our sleeping bag/quilt buyers guide for more info). We view the 22°F rating as more of a "lower limit" than a "comfort" rating. Like most lower limits, we would add about 10°F for a realistic comfort rating, which means we recommend this quilt down to around freezing, but not below. For the record, this type of exaggeration is sadly commonplace in the competitive sleeping bag industry, where every listed spec can be considered an advantage. SUB-FREEZING TEMPS - If we’re planning to encounter sub-freezing temperatures, we usually opt for a fully-enclosed mummy sleeping bag with a hood rather than a quilt. This is because quilts can be drafty in colder temps, even with pad attachment straps. That said, many summer backpacker rarely travel in near-freezing conditions, and quilts are awesome in those circumstances. If you do plan on taking your quilt on chilly trips, we recommend closing up the footbox, using the pad attachment straps, and being prepared to bundle up with extra clothing, like a warm hat, gloves, and a down coat with a hood. Aftermarket down hoods are also an option. And sizing up in length and width can offer additional warmth and coverage, especially when you're wearing bulky extra clothing. DOWN FILL - The Flex 22 comes in three different down fill options: 900fp Goose Down, 900fp HyperDRY Goose Down, or 850fp HyperDRY Duck Down. All options are high quality and responsibly sourced, so you really can’t go wrong. If you backpack in wet, rainy conditions often, it may be worth getting the water-resistant HyperDRY down feathers. As for the 850fp vs. 900fp choice, the 850fp duck down is less expensive, but a bit heavier. We prefer the 900fp goose down, but again you can't go wrong. QUALITY - The Katabatic Flex 22 is made in the USA by a small manufacturer based in Colorado. We think the overall craftsmanship, materials, and attention to detail is exceptional with this product. PRICE - One downside that usually comes with high quality materials is a higher price point. We've found that Katabatic products do tend to be a bit more expensive than the competition, but not outrageously so. And quilts like this are often less expensive than high quality sleeping bags. The price of the Flex 22 is between $285.00–$445.00, depending on the sizing and down fill options you choose. 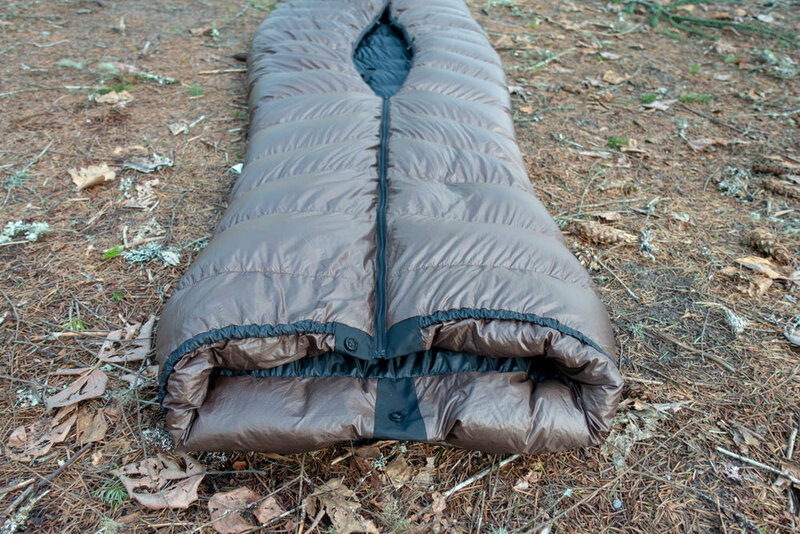 DESIGN - The Flex 22 quilt can be opened completely like a comforter on warmer nights or you can zip and close the footbox completely when temps drop. You can also use the included pad attachment straps to hold the quilt securely over your body on cold nights. We also often use the Flex like a blanket around a campfire or for stargazing. We love this design and think it's versatility is excellent. 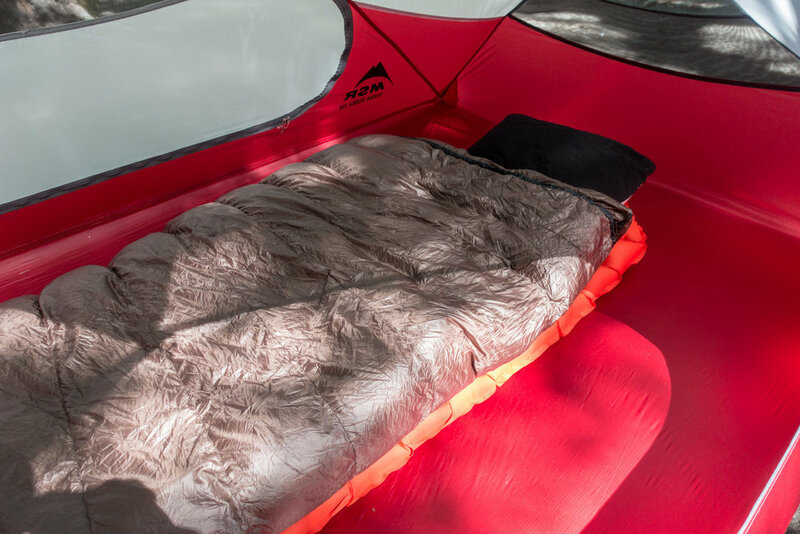 TEMPERATURE RATING OPTIONS - Katabatic makes the Flex quilt in a few different temperature models: 15°F, 22°F, 30°F and 40°F. We chose the Flex 22 because it’s warm enough to keep us comfortable down to around freezing, which will cover us on the majority of our three-season backpacking trips. If you find yourself backpacking in below-freezing temperatures, we recommend bumping down to the 15 degree model or choosing a sleeping bag (find our favorite sleeping bags here). FOOTBOX - The footbox has a zipper that runs about 1/3 the length of the quilt and helps create an enclosed place for your feet on chilly nights. To fully enclose the footbox, zip up the zipper, snap the footbox enclosure, and pull the drawstring (photos below). WIDTH AND LENGTH OPTIONS - The Flex 22 comes with three length options and two width options. The length options are designed to fit hikers with heights no taller than 5'6", 6', or 6'6". Wide options are offered in the 6' and 6'6" lengths. If you're on the edge, we recommend bumping up a size in length and width for full coverage on chilly nights. This can be especially beneficial when you need to wear extra clothing like a bulky puffy coat or when you want to pull the quilt over your head. Dave is 6'2" with a normal build, so he choose the 6'6" wide size, and he's very happy with it. STYLE - Unfortunately, the Flex 22 only comes in one color, as do the other temperature models. Other manufacturers give more options for style customization, but may take longer for your product to be built. At the end of the day, functionality usually trumps style, but customization is always a nice touch. NECK - The neck of the Flex 22 has a clip, cinch strap, and a neck baffle to contain heat. In general, we find this design to be great, but when the strap is cinched the cord can sometimes hang down and rub against our face at night, which is a bit annoying. CONTINUOUS BAFFLES - The Flex 22 has continuous horizontal baffles, which allows for some warmth versatility. On cold nights, you can move the down to the center of the quilt, so it will be where you want it the most: on top of your body. On warm nights, you can shift the down to the sides, so you won't get overheated. This is a bit of a pro move, but it can come in handy if you're aware of it. ZIPPER - The YKK zipper on the Flex 22 is lightweight and high quality, but also feels a bit fragile, so take care with it. PAD ATTACHMENT STRAPS - In general, we find pad attachment straps for quilts to be more cumbersome than they’re worth, so we rarely use them, and may even leave them at home depending on the trip. If we’re going on a trip that will be very cold (freezing or below), we usually opt for a sleeping bag over a quilt. That said, the Katabatic Flex 22 does have one of the more secure quilt pad attachment systems we’ve tested. 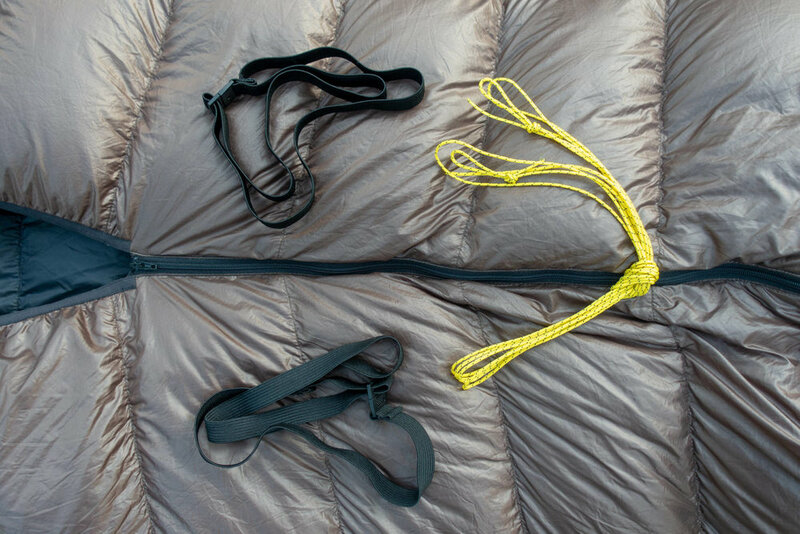 The Flex 22 comes with two lightweight yellow cords that you tie around your sleeping pad and attach to the quilt. The attachment clips have two modes, one that will allow the clips to slide along the cord and one that will lock the clips in place tightly. 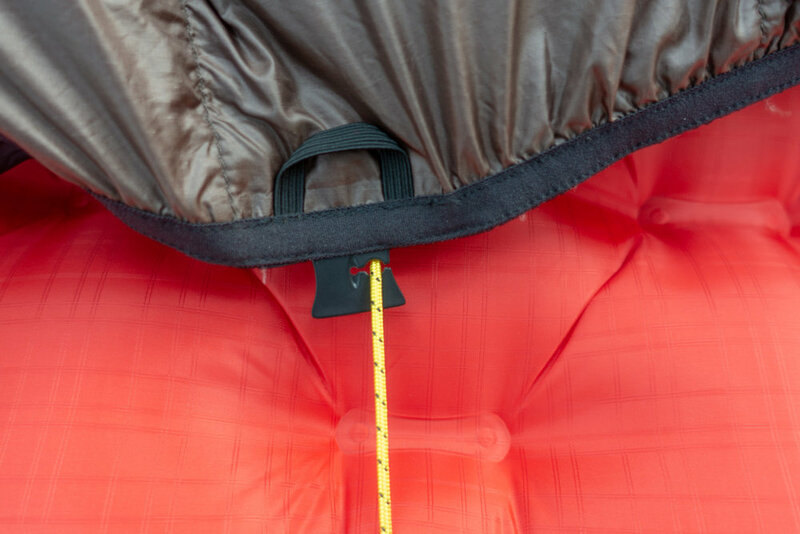 In addition, the Flex 22 comes with two stretchy elastic straps with clips that can pass through loops on the quilt to keep the bottom opening from widening. In general, we think the pad attachment straps are helpful on truly frigid nights, but they're also a bit annoying to deal with (like most pad attachment straps in our opinion). 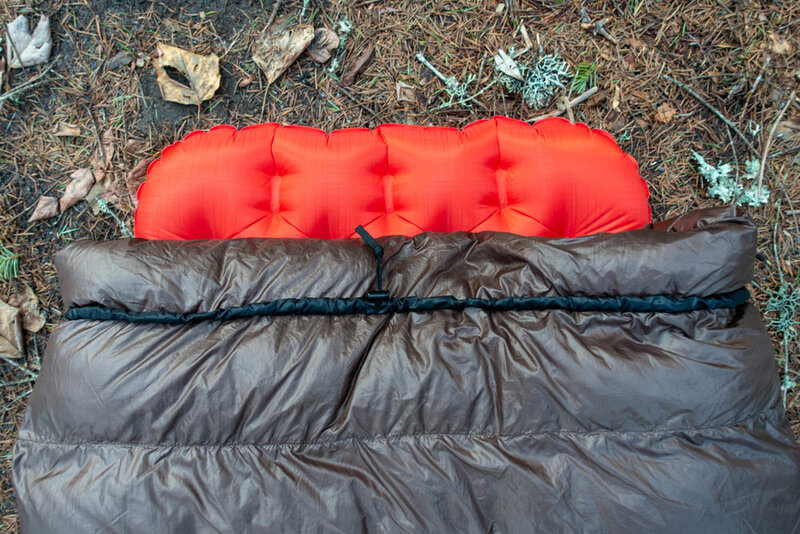 We think the Katabatic Flex 22 quilt is an excellent offering for the backpacking community. For the majority of our spring, summer, and fall backpacking trips we prefer down quilts because we find them to be far more comfortable than a tight-fitting mummy bags. The Flex 22 also delivers an excellent warmth-to-weight ratio, quality materials, dependable craftsmanship, a versatile design, and a good pad attachment system. 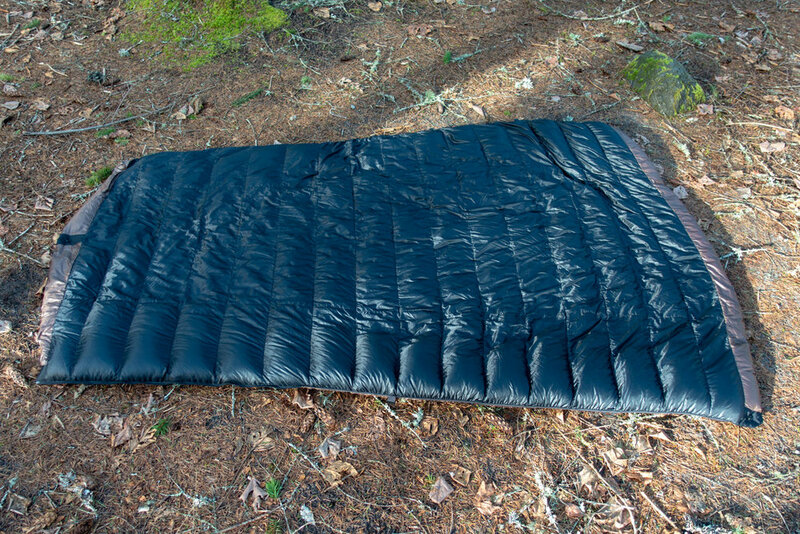 The Flex 22 isn't the lightest or cheapest backpacking quilt on the market, but it is competitive in those arenas. All in all, we think the Flex 22 is a great choice for comfort and warmth on backpacking trips where nighttime temps won't dip below freezing. Check out our best backpacking quilts and sleeping bags list if you want to see some of our other top recommendations. We were provided a free testing sample of this quilt but we are under no obligation to give it a positive review. Some of the links on this page are affiliate links, which means we may receive a small commission if purchases are made through those links. This adds no cost to our readers and helps us keep our site up and running. Our reputation is our most important asset, which is why we only provide completely honest and unbiased recommendations.